Thanks for all the birthday messages, it means alot... oh by the way Nat and Kirst i'm 23 but we can pretend i'm 22! So for my birthday, I had my suprises in the morning which choked me up and a few extras off gem, it pissed down with rain all day so it was quite quiet but we did venture out once it stopped raining on the night to go an watch a thai boxing match, it was good fun and a real atmosphere but very violent. There was 1 girl fighting from england against a local, and we won!! After the boxing we went for some drinks on Bangla Road then phoned dad at about 3 on the way home suprisingly sober...gem was a bit merry to say the least! One thing we forgot to mention and this applies mostly to Paul as he has seen the video. Six months ago Wes watched a video on Utube about a guy who had his thumb bit off by a moray eel while diving and his girlfriend filmed it, he was feeding them sausages underwater and the eel mistook his thumb for a sausage, he ended up having one of his toes grafted on in place of the missing thumb. Randomly we met this guy on our diving trip, he is the cameraman for scuba cat (the company we dived with). It really blew Wes away....what are the odds! 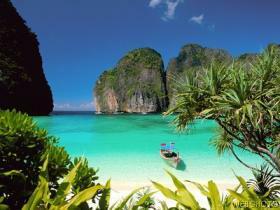 Another chill out night tonight then off to Phi Phi on Friday morning then over to Krabi - see the picture!